Textbooks had to be rewritten. Members of the public were outraged. Our understanding of the solar system itself was forever changed on Aug. 24, 2006, when researchers at the International Astronomical Union (IAU) voted to reclassify Pluto, changing its status from a planet to a dwarf planet — a relegation that was largely seen as a demotion and which continues to have reverberations to this day. Several years later, many still don't quite understand all the fuss, nor why Pluto was knocked from its planetary position. But the solar system's transformation from nine planets to eight was a long time in the making and helps encapsulate one of the greatest strengths of science — the ability to alter seemingly steadfast definitions in light of new evidence. What is a planet, anyway? The word planet stretches back to antiquity, deriving from the Greek word "planetes," which means wandering star. The five classical planets — Mercury, Venus, Mars, Jupiter and Saturn — are visible to the naked eye and can be seen shifting in strange pathways across the sky compared with the more distant background stars. After the advent of telescopes, astronomers discovered two new planets, Uranus and Neptune, which are too faint to spot with the naked eye. Pluto was found and classified as a planet in 1930, when astronomer Clyde Tombaugh of the Lowell Observatory compared photographic plates of the sky on separate nights and noticed a tiny dot that drifted back and forth against the backdrop of stars. Right away, the solar system's newest candidate was considered an oddball. Its orbit is so eccentric, or far from circular, that it actually gets closer to the sun than Neptune for 20 of its 248-years-long trip. In 1992, scientists discovered the first Kuiper Belt object, 1992 QB1, a tiny body orbiting out in Pluto's vicinity. Many more such objects were soon uncovered, revealing a belt of small, frozen worlds similar to the asteroid belt between Mars and Jupiter. 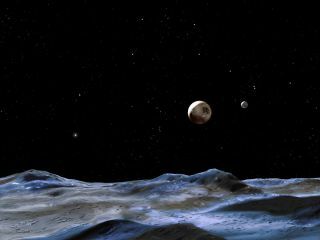 Pluto remained the king of this region, but in July 2005, astronomers found the distant body Eris, which at first was thought to be even larger than Pluto. Size of Pluto (lower left) in comparison to Moon and Earth. Researchers had to ask themselves these questions: If Pluto was a planet, then did that mean Eris was one as well? What about all those other icy objects out in the Kuiper belt? Where exactly was the cut-off line for classifying a body as a planet? A word that had seemed straightforward and simple was suddenly shown to be oddly slippery. Intense debate followed, with many new proposals for the definition of planet being offered. "Every time we think some of us are reaching a consensus, then somebody says something to show very clearly that we're not," Brian Marsden, a member of the IAU Executive Committee in charge of coming up with a new meaning for the word planet, told Space.com in 2005. A year later, astronomers were no closer to a resolution, and the dilemma hung like a dark cloud over the IAU General Assembly meeting in Prague in 2006. At the conference, researchers endured eight days of contentious arguments, with four different proposals being offered. One controversial suggestion would have brought the total number of planets in the solar system up to 12, including Ceres, the largest asteroid, and Pluto's moon Charon. The suggestion was "a complete mess," astronomer Mike Brown of Caltech, Eris' discoverer, told Space.com. Near the end of the Prague conference, the 424 astronomers who remained voted to create three new categories for objects in the solar system. From then on, only the worlds Mercury through Neptune would be considered planets. Pluto and its kin — round objects that shared the neighborhood of their orbit with other entities — were henceforth called dwarf planets. All other objects orbiting the sun would be known as small solar system bodies. A contingent of professionals did not take the decision lightly. "I'm embarrassed for astronomy," Alan Stern, a leader of NASA's New Horizons mission, which flew past Pluto in 2015, told Space.com, adding that less than 5 percent of the world's 10,000 astronomers participated in the vote. Such views are shared by many in the public. In 2014, experts at the Harvard & Smithsonian Center for Astrophysics (CfA) in Cambridge, Massachusetts, debated different definitions of a planet. Science historian Owen Gingerich, who chaired the IAU's planet-definition committee, asserted that "planet is a culturally defined word that changes over time." But the audience watching the CfA debate overwhelmingly chose a different participant's definition — one that would have brought Pluto back into the planetary fold. Alternative classification schemes continue to pop up. A 2017 proposal defined a planet as "a round object in space that's smaller than a star." This would make Pluto a planet again, but it would do the same to the Earth's moon as well as many other moons in the solar system, and bring the total number of officially recognized planets up to 110. A year later, Stern, along with planetary scientist David Grinspoon, wrote an opinion article in The Washington Post arguing that the IAU's definition was "hastily drawn" and "flawed" and that astronomers should reconsider their ideas. But such pleas have fallen on deaf ears so far, and it seems unlikely the IAU will revisit the controversy any time soon. Astrophysicist Ethan Siegel responded to Stern and Grinspoon in Forbes by writing: "The simple fact is that Pluto was misclassified when it was first discovered; it was never on the same footing as the other eight worlds." Mike Brown also chimed in. "So, hey, Pluto is still not a planet. Actually, never was. We just misunderstood it for 50 years. Now, we know better. Nostalgia for Pluto is really not a very good planet argument, but that's basically all there is. Now, let's get on with reality," Brown wrote on Twitter, where he has embraced his role in the redefinition with the handle @plutokiller. Learn more about the Kuiper Belt from NASA's Solar System Exploration website. See images of Pluto from NASA's New Horizons spacecraft flyby.